Maybe the signs were there from their qualifying form, but even in qualifying Ivory Coast were not this bad. With a stubborn defence and quality in their attack, you had to trust them to come good at some point; or at the very least to make it through to the knockout stages before their incoherent attack, exacerbated by the absence of Gervinho, became an issue. From the opening half of their first game to the second half of tonight’s game Ivory Coast never looked like defending champions, and never looked like exiting the group stages. They came into tonight’s game knowing it was win or bust, but their performance didn’t reflect that of a side fighting to stay in the tournament. Coming into the final game needing a win against an increasingly organised Herve Renard team was inadvisable, and so it proved to be the case tonight. The lack of rallying pressure at any point in the tournament, even if stifled tonight by a disciplined and organised Morocco, made for a bizarre and underwhelming defence of their title. The Frenchman came into the tournament with an XI that, for the vast part, named itself. It was to unravel rather quickly, with his thought clouded solely on the below-average opening day performance against Togo. It appears Dussuyer didn’t see it as an exception. The DR Congo game saw Jonathan Kodjia, one of Ivory Coast’s most consistent players in the past year, and Jean Seri, arguably Ivory Coast’s most creative player, both benched for the rest of the tournament before coming on as substitutes tonight. His side looked clueless tonight and he seemed at a loss as to how he could tactically overcome Morocco. 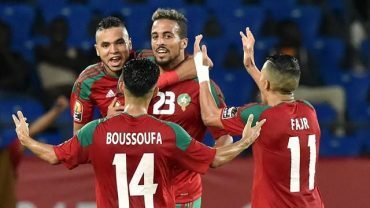 A few days ago I wrote that making the right changes at the right time is key to an AFCON-winning coach and Dussuyer failed spectacularly in that regard, dropping the right players (Seri, Kodjia, Max Gradel), sticking with the wrong ones (Wilfred Bony, Salomon Kalou on the wing, and an underwhelming Franck Kessie) and usually substituting the better performing ones. For comparison’s sake it’s good that Michel Dussuyer came in straight after Herve Renard. With most of the players that won AFCON 2015 still part of this team, it just goes to show that as much as a good coach can win you an AFCON a bad one can make you under-perform. Dussuyer horribly mismanaged the squad and failed to get the best out of them. It’s made his position untenable. Had they lost tonight it wouldn’t have been a true reflection of their tournament. They outclassed DR Congo on the balance of play in their first game, only to lose thanks to an error by Munir. While they were helped by Dussuyer’s inability to produce solutions tonight, their work-rate off the ball was, as always, impressive and they cut the link between Ivory Coast’s midfield and attack, meaning Les Elephants often had to go long. The additional numbers in defence make them a difficult team to break down, even when there’s an individual error there always seems to be another player ready to sweep up. Tactically, it’s hard to say with confidence whether there’s any other coach left in the tournament who could conquer Morocco’s 5-4-1. The only concern for Herve Renard is producing enough in the attacking third. Rachid Alioui produced something magical tonight, and Faycal Fajr’s set-piece delivery is proving to be an important asset, but can they go all the way relying on such functional football? Whilst Senegal might be getting most of the attention from onlookers of AFCON 2017, DR Congo undoubtedly take up second place in the rankings of the best team at this tournament, as they once again produced an incredibly exciting performance in Port Gentil to see them top the group. Free-flowing and free-scoring, The Leopards continued demonstrated their ability to wow, combining the sublime individual talents of their frontline with some effective attacking teamwork. Junior Kabananga and Neeskens Kebano were excellent going forward, with Chancel Mbemba providing a number of vital contributions with some fine examples of positive passing play, evidencing his ability to take part at both ends of the pitch. Undoubtedly the minnows of this group, Togo could not quite manage to use their previous experience at Africa Cup of Nations tournaments to reach the knockout stages this time around, as they proved to be a very welcome small fish in a big pond with some concerted performances in Gabon. Restricted ultimately by their lack of talent and restrictions in players available to them, the fact Togo consistently make it this far is something that is incredibly impressive, as this experienced side used all their nouse to try and overcome this in the group stage. Despite battling all over the pitch, they just could not keep ahold of the chaotic Congolese attack, as their over-reliance on free agent Emmanuel Adebayor very evident. But these are the sorts of minnows we want. Led by the wonderful Claude Le Roy, you had a feeling he would be the man unable to pick at the DRC’s occasional disregard for defensive organisation and cause an upset, but this was not to be. Whether he will stay with Togo or move on and continue his quest to manage every single African nation, we shall see – but we hope to see this Togolese side in Cameroon in 2019. Can DR Congo really do the business in the knockouts? Traditionally a place for dour, defensive football that gets results, logically one wouldn’t really give DR Congo much of a chance going forward. A side who are loved for their unrestricted approach to a fixture, how they hold up in the next round remains to be seen, given knockout football’s tendency to reward stern discipline and effective game management. With the last side to make a dent in a tournament who purveyed such a gloriously unhindered approach being the Ivory Coast side who lost to Zambia in the final of 2012, history is not on their side – especially given the fact that Ivory Coast’s squad that year was one of the best group of players available to an African nation ever. With a head-to-head with Ghana or Egypt the most likely outcome, Ibenge will need to instil an element of organisation into his team in the meantime, so to avoid getting picked off on the counter by a more patient opponent. But, as well all know at AFCON, things can be unpredictable. Whether DR Congo manage to beat off their opposition with their magical style or be proven incredible naive, it is most certainly going to be fun to watch.